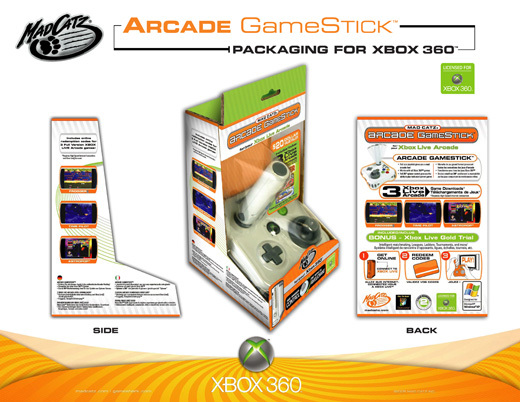 If you're an Xbox 360 arcade fan you must remember that Mad Catz Arcade GameStick we showed you a little while ago. We've some more details on this controller, which is meant to control all those classic games like Galaga, Street Fighter and Frogger. The controller itself has a main stick, a smaller stick (corresponding with the right analog) and the same number of buttons as the 360. 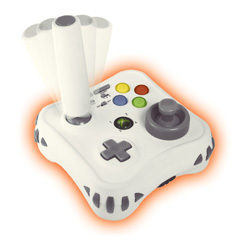 It'll work on any 360 game, and can even be plugged into your PC for Windows games. It'll retail for $49 in about a month. If you're looking for the authentic retro experience, this should fit the bill fairly nicely. Hit the jump for package shot.